I found this wood jewelry box at the thrift shop back in November. It had a nice shape but definitely needed a little love. Inspired by Jenny's project I decided to pay the $3 for it and see what I could do! The inside was a little grungy and there was a large crack in the top that needed fixing. So I rolled up my sleeves and got to work! 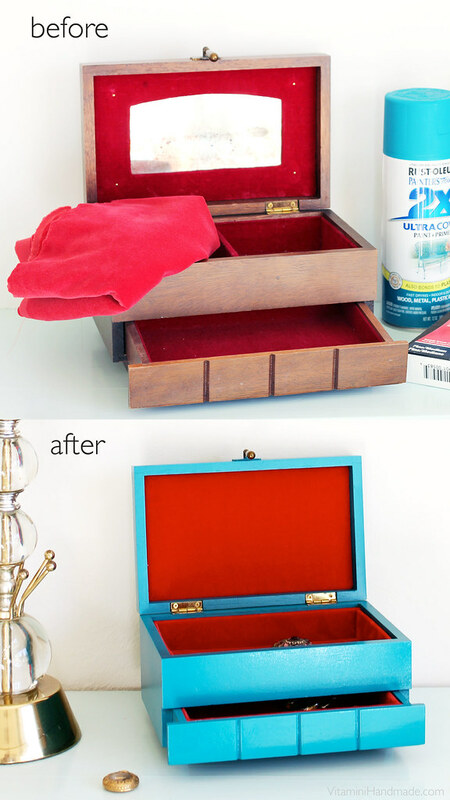 Using a pair of pliers, I removed the old velvet and cloudy mirror from the inside of the box. Then I sanded the whole thing down with the medium grit sandpaper. I filled the cracks with a few coats of wood filler, letting each coat dry before adding the next one. 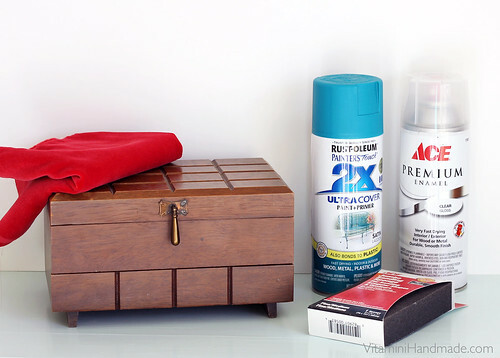 Then I sanded down the wood filler to match the box surface and wiped it down with a damp cloth to remove the dust. Time for painting! I left the hardware on and covered it with a piece of foil. 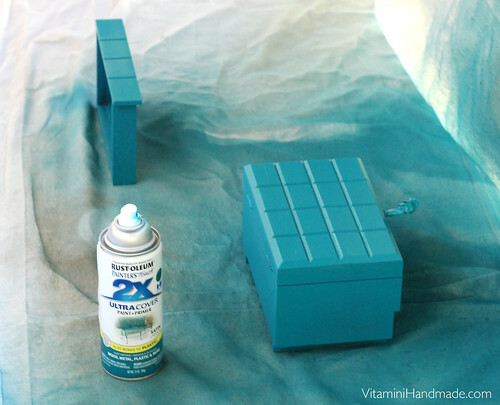 I can't remember how many coats I sprayed onto the box, but it was a few, maybe 5 or 6. Light, even coats are key! When the paint is dry to the touch add the gloss spray. I had trouble getting an even coat of gloss with this one. Maybe it was the brand I used? Not quite sure, but I feel like I had to add so many coats just to start seeing some gloss out of it. I'll have to try a different product next time. I let the box dry for a day or two before starting in on the velvet lining. I chose this great coral-red velvet to contrast with the bright teal outside. Using the measurements of the inside of the box, I cut out 5 chipboard rectangles: four for the sides and one for the bottom. 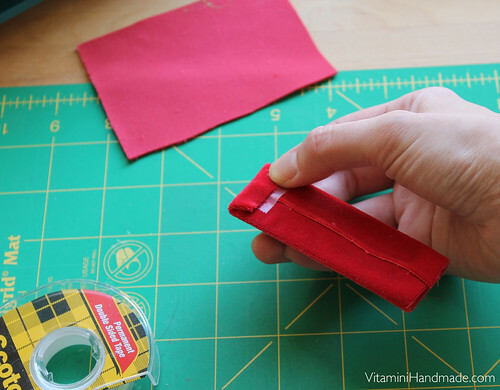 Then I cut pieces from the velvet about 1" longer and wider than the rectangles. 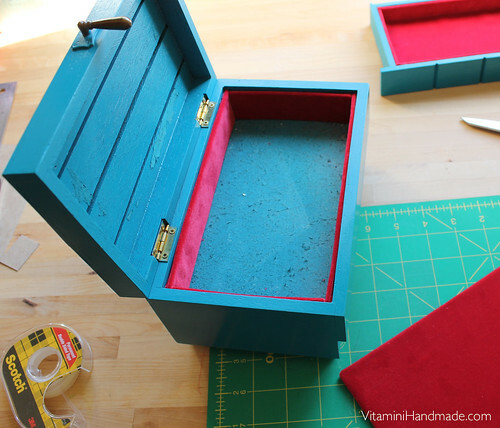 I attached the velvet to the chipboard with double-stick tape on the two long sides first and then trimmed the overlap. Then I folded the end pieces over, making sure to get clean corners (at least on the corners that will show). 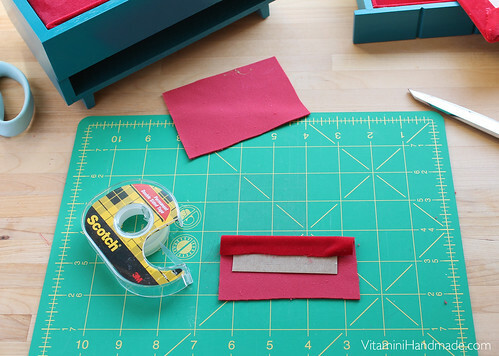 Hot glue the pieces into the box/drawer. I glued in the long sides, then short sides, and then the bottom. 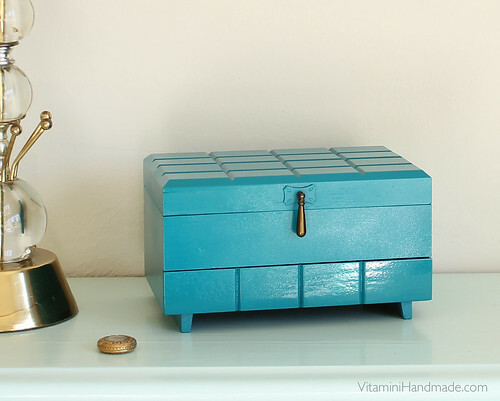 Now it's the perfect home for my vintage brooches. Not bad for $3 and about $10 in supplies! It already has a home on my dresser. What a great idea! 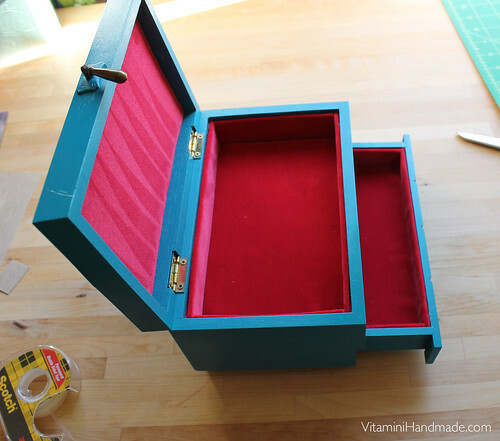 I see old wood jewelry boxes really cheap at Goodwill all the time.They always look pretty beat on the inside. Thanks for a great idea on how to make them fab again. I think an old photo or post card to replace the mirror would look really pretty. 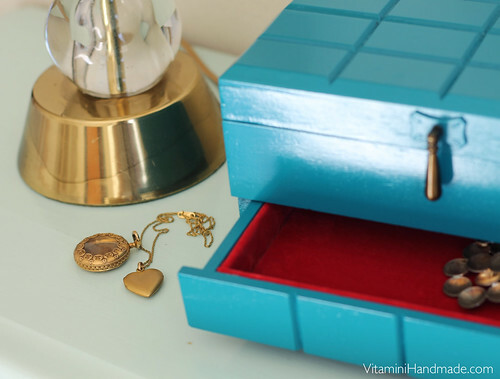 That's a great idea to add a photo or postcard to the inside of the lid! 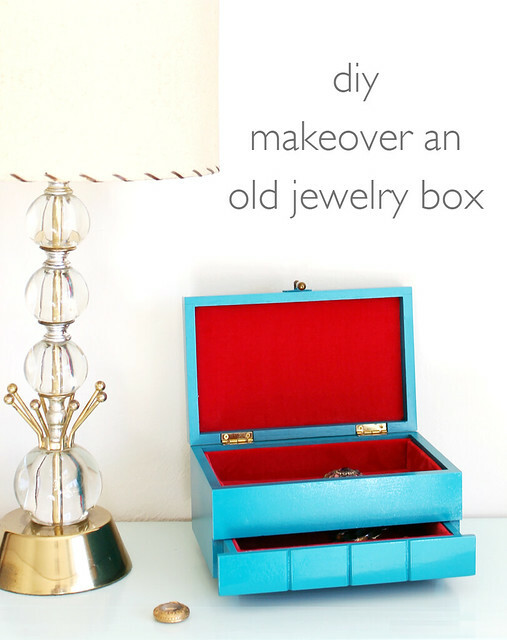 Let me know if you ever revamp a jewelry box of your own. I'd love to see how it turns out!